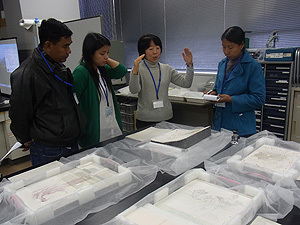 As part of the “Networking Core Centers for International Cooperation in the Conservation of Cultural Heritage Project” commissioned by the Agency for Cultural Affairs, 2 mural painting conservators from the Department of Archaeology and National Museum (DoA) of the Ministry of Culture of Myanmar were invited to train in Japan from March 9 to 13, 2015. The training consisted of lectures on conservation of mural paintings and practice conserving those items, a visit to a restoration studio, and viewing of temple murals. The training further educated the Myanmarese conservators about conservation of wall paintings in Japan. During the first half of the training, the conservators received lectures on aspects of Japanese murals (decorated kofun [ancient Japanese tombs], mural paintings in kofun, mural paintings on plaster found in temples, panel paintings, etc.) such as their history and the materials and techniques used to make them along with examples of their conservation. The conservators also received lectures on the materials and techniques used to conserve kofun mural paintings, and they practiced conserving simulated mural painting fragments. The trainees were highly interested in learning about materials and techniques, and they actively asked questions. In addition, trainees visited a restoration studio that restores Japanese works such as paintings and books. Trainees observed actual restoration work and they talked about basic policies regarding conservation in Myanmar and Japan. During the latter half of the training, trainees visited Kyoto and Nara and they viewed surviving murals in Houkai-ji, Horyu-ji, and Yakushi-ji. Trainees discussed the conservation of mural paintings with Japanese representatives as they closely observed mural paintings that were described in the lectures. The hope is to continue cooperation in the future so that the information taught during training will benefit projects to conserve mural paintings in Myanmar. Numerous Japanese artworks can be found in European and American collections overseas. However, there are few conservators of these artworks overseas, and many of these works cannot be shown to the public since they have not been properly conserved. Thus, the Institute conducts the Cooperative Program for the Conservation of Japanese Art Objects Overseas in order to properly conserve and exhibit these works. Works in the Manggha Museum of Japanese Art and Technology were surveyed because of the museum’s fervent desire and need for help with conservation. 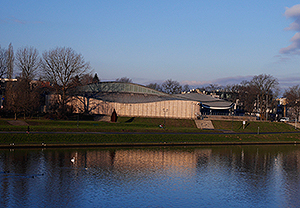 Located in Krakow (Poland), the Manggha Museum of Japanese Art and Technology is home to a number of the Japanese artworks found in Eastern Europe. The Kyoto-Krakow Foundation was founded by individuals such as the film and theatre director Andrzej WAJDA. The Manggha Museum of Japanese Art and Technology was established in 1994 with help from the foundation and private contributions and assistance from the governments of Japan and Poland. The museum’s collection centers on works collected by the art collector Feliks ‘Manggha’ JASIENSKI (1861–1929), and the collection includes a host of Japanese paintings such as ukiyo-e (woodblock) prints as well as pottery, lacquerware, and textiles. A survey of paintings in the collection was conducted in 2 phases of January 13–23, 2015 and February 3–6, 2015. The first phase surveyed 84 paintings. Seven of these works were selected based on their value in terms of art history and their urgent need for conservation. The second phase examined these 7 works in detail in order to determine the time needed to conserve them and appropriate methods of conserving them. Plans are to formulate a plan for conservation of the identified works and to conserve them under the Cooperative Program for the Conservation of Japanese Art Objects Overseas in the future. The information gleaned from the survey will be shared with curators and conservators at the museum so that these works can be conserved and exhibited. From January 19 to 26, emergency steps were taken to preserve collapsing portions of mural painting at pagoda No. 1205 and conditions indoors and the state of damage to the pagoda’s roof were surveyed. These efforts began last year. The survey of the roof corroborated the assumption that damage was due to rain leakage and termite nests. Plans are to explore effective countermeasures to deal with these problems in cooperation with personnel from the DoA. In addition, training on surveying and documenting restoration of mural painting was conducted at the Bagan Archeological Museum. Trainees were 5 experts in mural painting restoration from the Bagan and Mandalay branches of the DoA. 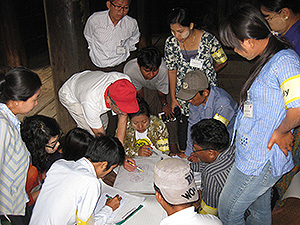 Surveying and documentation are seldom done during restoration efforts in Myanmar, so this training should teach attendees about basic surveying and documentation techniques and impress upon them the importance of those steps. 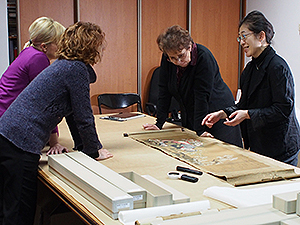 This workshop on the Conservation of Japanese Artworks on Paper and Silk is conducted annually as part of the Cooperative Program for the Conservation of Japanese Art Objects Overseas. This year, the workshop was held at the Asian Art Museum, National Museums in Berlin, with the basic course on “Japanese paper and silk cultural properties” taking place from December 3–5 and the applied course on “Restoration of Japanese hanging scrolls” taking place from December 8–12. During the basic course, attendees received lectures, demonstrations, and practice with the components that comprise a cultural property (paper, paste, animal glue, and pigments), the techniques of creating Japanese paintings and calligraphy, aspects of mounting, and handling of hanging scrolls. The course was attended by 20 restorers, curators, and students from overseas. The applied course included a workshop primarily on practice restoring a hanging scroll using traditional mounting and restoration techniques. Attendees received lectures on the structure of a hanging scroll (which consists of multiple layers of paper and cloth), decisions regarding restoration of those scrolls, and handling traditional brushes and knives. Attendees also received practice performing urgent repairs. This course was attended by 15 restorers and curators. 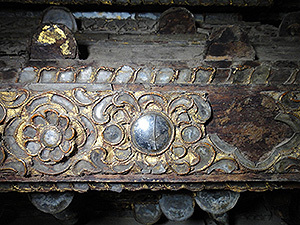 Over the past few years, Japanese mounting and restoration techniques have garnered attention from specialists restoring cultural properties overseas. These techniques can be used on foreign paintings and books. This workshop provided an opportunity for attendees to actually encounter mounting and restoration materials and techniques firsthand. Through these efforts, we hope to increase the understanding of tangible cultural properties such as paintings and books as well as the techniques for making Japanese paper and mounting and restoration techniques that can help to preserve those items. A Course on Conservation of Paper in Latin America was conducted as part of the LATAM program of the International Centre for the Study of the Preservation and Restoration of Cultural Property (ICCROM). The LATAM program seeks to conserve cultural heritage in Latin America and the Caribbean. The Course on Conservation of Paper in Latin America was jointly organized by the Institute, ICCROM, and Mexico’s Coordinación Nacional de Conservación del Patrimonio Cultural, Instituto Nacional de Antropología e Historia (CNCPC-INAH). The course was conducted from November 5 to 30 at the CNCPC-INAH, and the Course was attended by 9 experts in restoring cultural properties who hailed from the 8 countries of Spain, Cuba, Colombia, Ecuador, Brazil, Peru, Argentina, and Mexico. The course sought to provide attendees with basic knowledge and proficiency with regard to traditional Japanese paper, adhesives, and tools so that this knowledge and proficiency could be used to help conserve cultural properties in the attendees’ home countries. 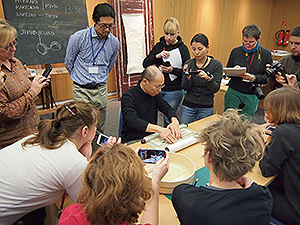 The first half of the course consisted of lectures by Japanese experts on materials and tools used in mounting and restoration techniques and then practice by the attendees. This year’s course focused on creating a work environment that provided safety during restoration work, work preparations, acquiring tools, and cleanup. 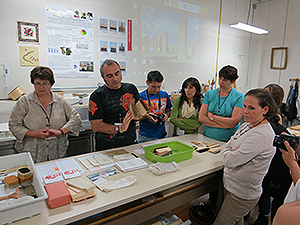 During the second half of the course, lectures were given by experts from Mexico, Spain, and Argentina who had completed the Institute’s International Course on Conservation of Paper. These lecturers described actual examples in which they had used Japanese techniques to restore cultural properties in the West. Afterwards, attendees practiced using those techniques. Given the likelihood that Japanese mounting and restoration techniques can be used to conserve cultural heritage in other countries, plans are to conduct similar training sessions in the future as well. 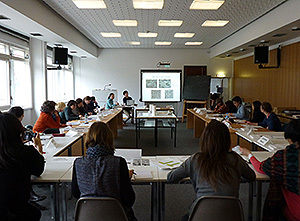 The course took place from June 2 to 13. Trainees were 8 staff members with specialties in architecture or archaeology from the main and branch offices of the DoA together with 1 associate professor and 3 students from the Technological University (Mandalay). The course consisted of classroom lectures at the DoA Mandalay branch office and on-site practice at Bagaya Monastery in the suburbs of Mandalay. The trainees learned techniques such as drafting schematic drawings of floor plans, measuring floor unevenness and the tilting of columns, and checking and recording what types of deterioration have occurred and their extent. Training concluded with each group announcing the results of its research. In addition, termite damage (a problem common to wooden buildings in Myanmar) was surveyed by an expert and a preliminary course on termite damage was conducted. Termite damage at Bagaya Monastery has spread to the upper part of the building, and monitoring of this damage commenced with the assistance of the trainees in order to examine effective countermeasures. From June 11 to 17, a survey of the state of murals and conditions indoors at pagoda No.1205 was conducted to continue previous efforts. Damage to murals was mapped during the current survey. The murals are quite sturdy, but the survey revealed damage that must be dealt with in the future, such as the weakening and collapse of murals due to rain leakage and termite nests. In addition, training on the conservation of murals and pest control was conducted at the Bagan Archeological Museum. This training was attended by 6 conservators from the DoA Bagan branch. The trainees were especially interested in practice using restoration materials like adhesives and fillers as well as lectures on pest control and practice controlling pests. Plans are to continue conducting training sessions with more practical content. Surveys were conducted in Bagan and Mandalay from June 11 to 19. The survey in Bagan was conducted in cooperation with the Lacquerware Technical University and Lacquerware Museum under the auspices of the Ministry of Cooperatives. The survey examined insect damage and it studied techniques that were used to produce lacquerware and damage to lacquerware in the museum’s collection. The survey revealed the need for urgent cleaning and the need to improve conditions for exhibition and storage of the pieces. In Mandalay, interviews on lacquer materials produced in Myanmar were conducted. In addition, techniques to produce glass mosaics in conjunction with lacquer decoration were studied at monasteries and shops selling those materials. 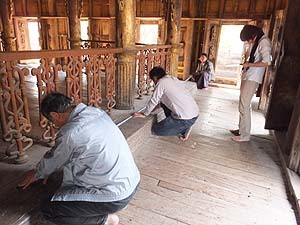 Lacquer techniques that were used on the outside of the Shwe Nan Daw Monastery were visually inspected along with insect damage. Most of the interior and exterior of this building features lacquer decoration. This inspection revealed that ultraviolet rays and rain had extensively damaged the lacquer decorations. As part of the Networking Core Centers for International Cooperation in the Conservation of Cultural Heritage Project in 2013 commissioned by the Agency of Cultural Affairs, 2 conservators of mural paintings from the Ministry of Culture of the Republic of the Union of Myanmar were invited to visit Japan from February 3 to February 7. During the first half of the visit, the restorers took part in training to restore mural paintings. This training took the form of a tour of a restoration studio that restores Japanese paintings and books, lectures on mural paintings restored in Japan, and lectures on materials and techniques used to restore mural paintings in Japanese tombs and practice using those materials and techniques. During the second half of the visit, the restorers viewed mural paintings in temples in Kyoto and Nara. During the tour, the restorers observed the mural paintings they had heard about in lectures close up, and restoration materials and techniques used in Japan and Myanmar were actively discussed. The visitors’ strong drive to restore mural paintings in Myanmar was apparent. Conducting similar training in the future and inviting conservators of mural paintings from Myanmar should buttress cooperation between Japan and Myanmar with regard to restoring mural paintings. 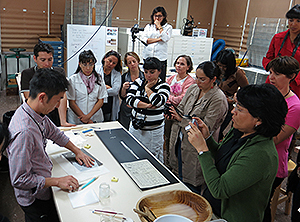 International training in Paper Conservation in Latin America was conducted jointly by the Institute, ICCROM, and INAH (Mexico’s National Institute of Anthropology and History) as part of the ICCROM-LATAM Program (conservation of cultural heritage in Latin America and the Caribbean). Training took place at the INAH from November 6th to 22th and was attended by 9 experts in conserving cultural properties from 8 countries: Argentina, Uruguay, Ecuador, Spain, Brazil, Puerto Rico, Peru, and Mexico. Training sought to provide attendees with basic knowledge of traditional Japanese paper, adhesives, and tools. 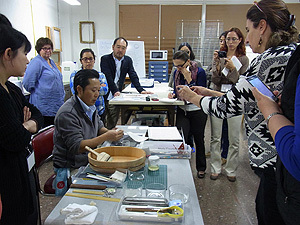 It also sought to enhance attendees’ understanding of Japanese mounting and restoration techniques by having them practice reinforcing, infilling, and lining using actual Japanese paper, adhesives, and tools. 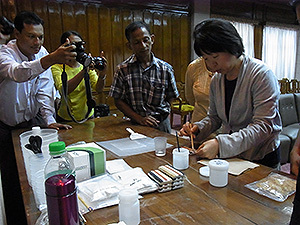 The first half of the training consisted of lectures by Japanese experts on materials and tools used in mounting and restoration techniques and then practice by the attendees. In the latter half of the training, lecturers from Mexico, Spain, and Argentina with experience conserving works using mounting and restoration techniques described how Japanese materials, tools, and techniques were actually used to restore cultural properties in Europe and the US, and then attendees practiced those techniques. Given the likelihood that Japanese mounting and restoration techniques will be used to conserve cultural heritage in different countries, plans are to conduct similar training sessions in the future as well. As part of the Networking Core Centers for International Cooperation in the Conservation of Cultural Heritage Project commissioned by the Agency for Cultural Affairs, Japan, the National Research Institute for Cultural Properties, Tokyo conducted a survey on safeguarding Myanmar’s cultural heritage in the Republic of the Union of Myanmar from October 23rd to November 1st. Among the art and craft works in Myanmar, the mission surveyed temple mural paintings and lacquerware. Institute personnel were accompanied and assisted by personnel from the Department of Archaeology, National Museum, and Library of Myanmar’s Ministry of Culture and university staff. 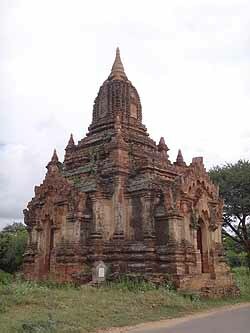 During a survey of temple mural paintings in Bagan, mural paintings in a hall in pagoda No.1205, a Buddhist monument scheduled for surveying and conservation by Japan and Myanmar, were imaged and the state of damage to those paintings was surveyed. 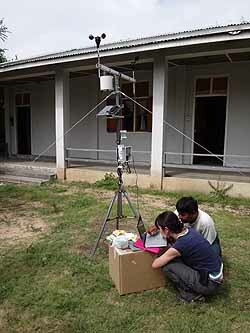 In addition, humidity and temperature recorders were set up inside and outside the hall at pagoda No. 1205 for environmental monitoring to ascertain meteorological conditions that might cause the mural paintings to deteriorate. Meteorological equipment was also set up at the site of the Bagan Branch of the Department of Archaeology, National Museum, and Library of Myanmar’s Ministry of Culture. In the future, plans are to collect and analyze data and devise policies for conservation of mural paintings in concert with personnel from the Bagan Branch of the Department of Archaeology, National Museum, and Library. During a survey of lacquerware in Mandalay, studios making items such as kamawaza (religious texts drew on lacquer) , glass mosaics, dry lacquerware, and begging bowls (used by priests to collect alms) were visited to observe the techniques and materials currently used to produce lacquerware in Myanmar and interview craftsmen. In Bagan, raw materials for bamboo crafts were studied and all of the ancient lacquerware in the museum of the Bagan College of Lacquerware Technology was surveyed. Plans are to continue conducting similar surveys in the future. 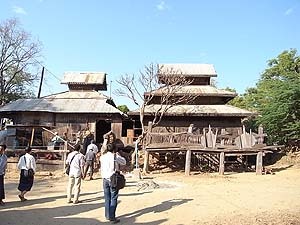 As part of the Project for International Contribution to Protection of Cultural Heritage (Experts’ Exchange) conducted by the National Research Institute for Cultural Properties, Tokyo under commission by the Agency for Cultural Affairs, a mission of experts was dispatched to Myanmar from January 26 through February 3. This mission, made up of 17 members in total, comprised three teams to study the fields of architecture, arts and crafts, and archaeology, respectively. The National Research Institute for Cultural Properties, Tokyo was responsible for the fields of architecture and arts and crafts, while the Nara National Research Institute for Cultural Properties was responsible for archaeology. Intended to make clear future directions of action for cooperation provided by Japan to Myanmar in regard to safeguarding of cultural heritage, the survey was able to advance smoothly with the accompaniment and assistance of the responsible staff members from the Department of Archaeology, National Museum and Library of the Myanmar Ministry of Culture. Together with checking the state of damage and key factors affecting conservation of brick monuments in Bagan as well as wooden monasteric buildings in Mandalay and other areas, the architecture team’s activities also included interviews with concerned staff of local agencies and craftsmen, to identify issues related to future conservation and restoration. These activities revealed such as the fact that full-fledged structural repairs had not been conducted in a long time and activities such as keeping basic records concerning the state of conservation were not being conducted to a sufficient extent. The arts and crafts team conducted surveys and interviews on the state of conservation, storage and exhibition, as well as training of human resources involved in conservation and restoration, for mural paintings , metal objects, lacquerwares, and books and sacred documents. It did so by visiting national museums and libraries, temples, schools, and workshops in Yangon, Bagan, and Mandalay. While they observed signs of the knowledge obtained through overseas training and other efforts being put to use in Myanmar, it also was clear that sufficient conservation and restoration measures were not being taken, due to shortages of materials and equipment and to underdevelopment of related systems. The mission also gathered basic information on Myanmar’s system for protection of cultural heritage through activities including meeting with the Ministry of Culture in the capital city of Naypyitaw. While it was clear that there were shortages in areas such as the technologies and human resources needed to conserve and restore cultural heritage in each field, the motivation of those in Myanmar to improve the situation was high, so that it is expected that technology transfer and human-resources development through projects such as joint research and training would be highly effective as assistance.